- How did you get started in the field of music and how did that lead you to composing? 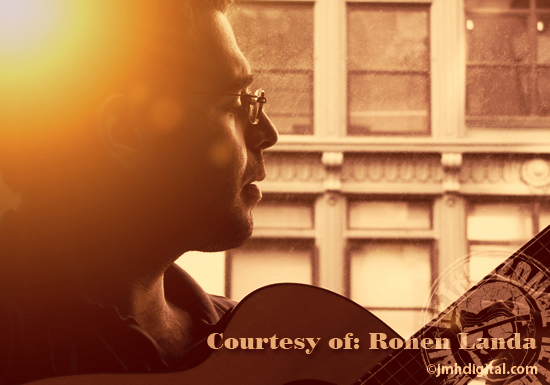 Ronen Landa: Sometime around junior high it became clear that I had a bit of a knack for the guitar, and my love of that instrument led me to explore all the genres that make use of it (rock, jazz, bluegrass, classical etc). In college I started taking theory and composition more seriously and was completely mesmerized by the contributions of composers from Palestrina to Cage; I also developed a fascination with ethnic music and with New York's improvisational scene. I wanted to be able to incorporate all these new influences and continue to expand as an artist so I began composing chamber pieces and trying out various approaches to music. - Please tell us your latest score release “THE PACT” with your inspiration, getting involved, best parts of being involved, interesting stories you can share and how much musical freedom did you have? Ronen Landa: I first got involved with THE PACT when a mutual friend introduced me to director Nicholas McCarthy who was looking for a score to accompany his original 10 minute short film by the same name. When it came time to make the feature, I was lucky enough to be looped in early-- I read the script and even spend a day on set teaching one of the actresses (Haley Hudson) a little nursery rhyme that Nick and I co-wrote called "The Judas Song". The score was inspired by the film's setting, which is a seemingly normal, everyday home that has been infiltrated by a ghostly presence. As a result I decided to record sounds that I created in my own home with appliances and kitchen items, etc, and then I manipulated those sounds digitally to create some of the unique textures and percussion in the score. The best parts of creating THE PACT score were my collaborations with Nick and also with the musicians. Nick is the kind of director who has extensive knowledge of film music and deeply understands its importance to the storytelling-- especially in a horror film like THE PACT where music is so critical to setting the right tone. When we work together on a cue I never feel like my artistic freedom is an issue, it's all about telling this story in the most effective way we possibly can. I've learned so much about film-making by staying open to his ideas! - If you work with other composers or music artists, whom do you work with and what is the best part of your contributions? Ronen Landa: I had quite a few musicians contribute their talents to the score! They are all amazing, honestly-- it sounds a little cliché but they really do bring the music to life and I am so grateful for their talents. The soloists were Anna Bulbrook (violin) and Dan Tepfer (piano) and they helped me find a beautiful tonal quality to the more emotional compositions. They also performed brilliant improvisations over my compositions that I subsequently edited into the score to create subtle textures that percolate beneath the surface. - Who inspires you musically and whom do you listen to [composers or music]? Do you feel that music downloading is hurting the industry or your thoughts that artists should release their work on a personal website and include all the download rates and a very limited Cd release? Ronen Landa: My influences are very numerous and all over the map! I try to listen to as much as I possibly can, and ultimately I'm drawn to composers who are willing to take risks and expand the boundaries of our art form. In the world of film scoring I'd say Ennio Morricone probably embodies that idea best for me, but there are many, many others. I think for less established artists it's important to get heard any way they possibly can. But as the music creators they need to find a business model that works for them and these days I don't think there is any one single path to success. - Out of all your released work, which gives you the best feeling of accomplishment and why? Ronen Landa: Wow that is tough because I've been lucky to be involved with some beautiful projects and they all mean a lot to me. I'm immensely proud of THE PACT because it started life as a short film that was being made for no reason other than the burning creative desire to just make something, and people responded to that and it's grown from there. If I had to point to something else, I'd probably single out my score for THE DREAMS OF SPARROWS which appeared on my last compilation album ("Picturebooks"). That documentary film was shot in by Iraqi filmmakers around 2004 in the early days of the Iraq war; I feel very privileged to have contributed to a project with that kind of historical value, and working with artists who were just emerging from underneath totalitarian oppression was an incredibly moving experience. - Walk us throughout a typical day or not so typical? Ronen Landa: Music surrounds my life every day. I usually answer my emails in the morning with a guitar on my lap-- I just feel better that way! When I'm scoring a scene I'll usually watch it without music a few times until I start to get a feel for the pacing, the moments I'd like to highlight and so forth. Then I get the technical elements ready in my sequencer and get to work. Honestly I feel like I'm in a different state when I'm writing music, like I'm tuned to some other frequency, from which I only emerge many hours later. Occasionally I remember to eat and sleep. Ronen Landa: I'm always curious to know how people first got interested in film music-- was it a particular film or soundtrack album that hooked you? Retro's Response: I began loving score music since the first Star Wars film was released and found myself a slow start into collecting score music. 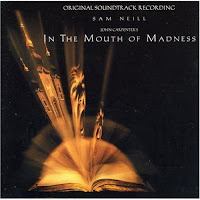 The one that started it all for me was "In the Mouth a Madness" after that I began that collection and a few thousand scores later... my ears are still finding new things musically.